Calling all paddlers! 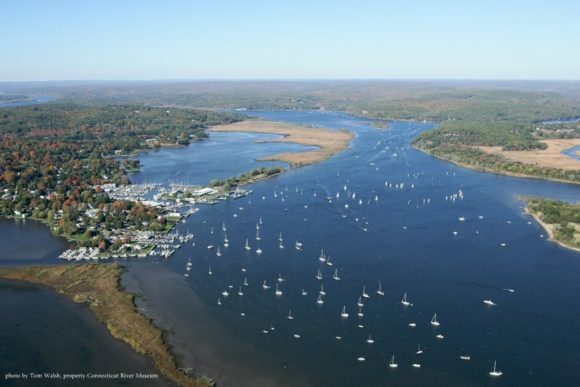 Conquer the Current challenges you to row from Haddam to Essex in support of education scholarship programs at the Connecticut River Museum. Photo by Tom Walsh, Shoreline Aerial Photography, Connecticut River Museum Collection. 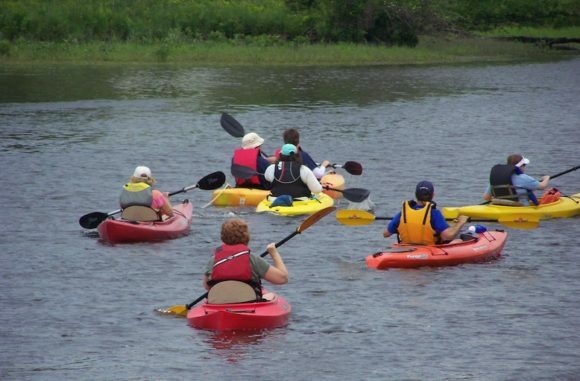 ESSEX — The Connecticut River Museum’s first downriver paddle regatta to benefit the Museum’s education scholarship fund will take place Sunday, Aug. 13, from 8 a.m. to 3 p.m. The Regatta is open to all paddle craft- canoes, kayaks, stand up paddleboards and rowboats. The nine-mile race will start at Eagle Landing State Park in Haddam and finish in front of the Connecticut River Museum in Essex. Paddlers will haul out at the Essex town boat launch and transportation will be provided back up to Eagle Landing State Park. There will also be activities on the Museum lawn throughout the day, including stand-up paddle board demonstrations by Paddleworks of Clinton and a family fun paddle parade in Essex Harbor at 12 p.m. Refreshments will be available from Porky Pete’s, Deep River Snacks, and Cannoli’s on the Run. Pre-registration is $30 per paddler with an additional $70 fundraising goal or $110 registration fee day of event. Prizes will be awarded for race winners and top individual and team fundraisers. All proceeds from the event will go directly toward supporting the Museum’s education scholarship fund. Connecticut River Museum’s first annual ‘Conquer the Current’ Regatta takes place Aug. 13. During the 2016/17 school year, 4,000 school children from across the state of Connecticut received invaluable hands-on history and environmentally-based programs at the Museum and in their classrooms. The scholarship program allowed for nearly 1,000 of these students to receive free or reduced admission, creating invaluable opportunities for students who might not otherwise have this experience. For more information about this program, visit ctrivermuseum.org or contact the Connecticut River Museum at 860.767.8269 or via email at esistare@ctrivermuseum.org. The Connecticut River Museum is located at 67 Main Street, Essex and is open daily from 10 a.m. to 5 p.m. Admission is $10 for adults, $7 for seniors, $5 for children age 6-12, free for children under 6. This year a recreation of Adriaen Block’s the ONRUST is at the Museum’s docks and providing special programs and public cruises. Conquer the Current is generously sponsored by: Denali, Essex Marine Group, Family Legacy Partners, Ivory Wealth Management, Lawrence & Memorial Hospital, The Sound Runner and Deep River Snacks.